One month after hosting a Bigger Online Super Series, Americas Cardroom goes bigger. 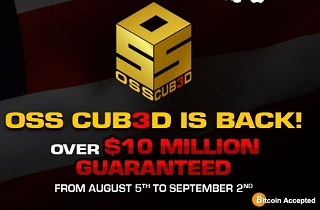 The US-facing online poker site announced their next OSS Cub3d tournament series to be held from August 5th to September 2nd. This tournament will be featuring $10 million in guarantees and three individual $1,000,000 tournaments. The OSS Cub3d is Americas Cardroom’s 3-part tournament series. This is made up of the small stakes Mini Online Super Series, the flagship Online Super Series, and high roller Bigger Online Super Series. The MOSS features a $300,000 GTD tourney on August 12th at 4pm ET ($88 buy-in). Also included are three leaderboards — one for the MOSS, OSS, and BOSS. The winner of each will receive an $8,000 Live Cage prize package. Each package includes the Live Cage buy-in, accommodations in beautiful San Jose, Costa Rica, and money for travel and spending. Players looking to boost their bankroll before the OSS Cub3d are in luck. They will earn a 50% reload bonus up to $200 by using code MOSS between July 29th and August 3rd. For more information on the OSS Cub3d, visit AmericasCardroom. This entry was posted in Casino Blog and tagged Americas Cardroom BOSS, Americas Cardroom MOSS, Americas Cardroom OSS on July 27, 2018 by admin.